The beginning of October means a lot of things to people. Some people have October birthdays and October anniversaries. Yay! For some of us, it means that an old friend is back. SCANDAL!!!! Last year, I wrote recaps for another site for Scandal. Doing so made me realize that too much detail is too much and helped me hone my writing. I don't think I'll be doing that this year, mostly because I don't think it'll fit in my schedule. So instead, I'll post all of my randomness here. At the end of last season, we learn the goon that had been punking everyone the whole time (I dubbed him Earl because they didn't give him a name) was Olivia's father. Which was good, because before then we knew almost nothing about Olivia's past. She could've been hatched for all we knew. We still don't know about her mother or siblings or any of her back stories. Some people think Harrison could be her brother. I don't know about that one. According to what I've read (no spoilers), most of the foolishness from last season gets addressed early on, and then they get on to something new. 1. Anyone else still highly dissatisifed with Seven Fifty Two? I wouldn't mind it if it didnt' conflict with what we already knew about Huck's past. But it did and it still doesn't sit well with me. 2. Is Harrison going to get a love interest? Or a back story? Or an anything. I know a lot of you soon for Harrison, and while I don't personally understand it, I'm sure you too want him to do something more than answer the phone and talk fast. 3. Is Quinn going to go full crazy on us? I kind of hope so, I like crazy wet-work Quin way more than whiny crybaby Quinn. Although she certainly has a reason to be whiny. 4. Will David and Abby stop fighting it? You want to be together, then be together. That's it. This is America, love who you want. 5. Other than Fitz, and that garbage they tried to feed us about Huck, we know little to nothing about the characters back stories. Maybe this is the year we'll learn about what is truly motivating everyone. I'm totally looking forward to the return! 1. I actually loved the 752 episode because of the backstory it provided. It may not have been the greatest execution for a backstory but I think it did its work. 2. I don't really have a thought in my head about Harrison right now. I'm convinced he isn't going to be on the show for that much longer. That being said, it would be nice to see something about his backstory. He's sort of like an unused appendage right now. 3. I sooo want Quinn and Huck to get together in a wet-work kind of love story..but then again it would be nice if he were reunited with his wife and son. I am torn. 4. David and Abby aren't really on my radar, is that bad?? I just don't care that much about them. 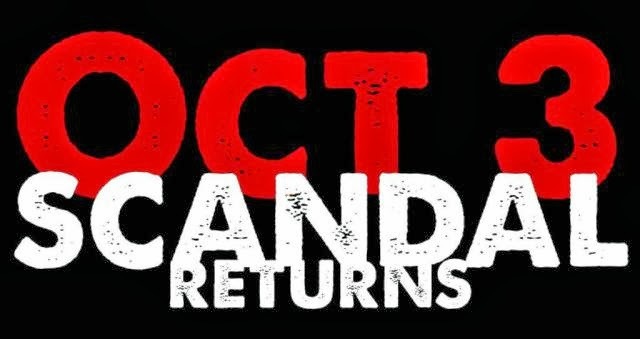 I love scandal! I've been going through withdrawal symptoms since the season ended. My Thursday nights are just not the same. I'm interested to see what happens with Quinn also, she seems to be going all hacker girl crazy and loving it. I'm also digging for info about Huck. He is just so mysterious to me.